I've seen this film upwards of seven or eight times, and it never disappoints. I'll be back soon with a longer comment, but for now I have to say, please don't skip this one! It's an amazing art comedy with the world's funniest ending. Seen it once. Maybe I will revisit it. There's a certain ironic quality that we don't often get in the non-US films that get shown over here. A little hard to pin down but SS5 makes me think of it. I think the foreign ness and subtitles introduce some distance, and then a further ironic distance is sort of too much for people. Or that's what film distributors think. Another example of what I'm thinking of would be the Korean movie Flanders Dog (? ), which is sort of a shaggy slacker comedy a bit like The Big Lebowski IIRC. The director has since crossed over to the West, I think he made Snowpiercer or whatever, but that seems more conventional and less surprising to me. When I was a senior in high school, I was just starting to get into Japanese horror cinema. I'd seen Ring, Audition, Battle Royale, a lot of the ones most popular with western audiences. At the time I frequented the wonderful Sarasota, Florida video rental store Video Renaissance (which is, thankfully, still going strong). The store only employed three people, and each of them had a flat out ridiculous breadth of film knowledge. I'd bring up an obscure movie to one of them and they'd start talking about, like, the lighting grip and what other films he'd worked on, no joke! One day I told the owner I was looking for a weird, disturbing Japanese horror film. 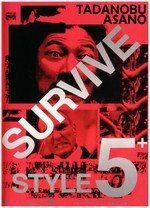 He fetched me this film I'd never heard of, Survive Style 5+. It was a region-free Japanese DVD, with very little English on the packaging. When I got home and popped it in, all the menus were in Japanese too. I had absolutely no information about the film aside from the store owner's vague recommendation. The film did open like a horror movie, and I had no reason to think it wasn't one. It wasn't until the milk spit-take and the bonkers opening credits sequence that I had any inkling that I'd been bamboozled into renting a comedy. But I'm so glad I was. That was the perfect way to discover this insane movie. There's just so much to talk about. The maximalist, surreal sets. The wife-murderer's mansion, the burglars' Mardi Gras car, the pastel pink airplane interior with framed paintings of clouds. The hitman translator's yellow blazer and tiny red crab pin. The "SMILE PLEASE" label under the surveillance feed in his office. The other little labels hidden about, including "DO NOT STEP" under the window, and "ARE YOU A SAFECRACKER?" on his safe. The hospital scene with the doctors' oversized military jackets and the weird useless fish lamp we keep cutting to. The super hip soundtrack. The absurd pretend commercials! Bird Dad's whole demeanor! Vinnie Jones' inexplicable appearance and delightful scenery chewing. I love it all so much. As many times as I've seen this movie, there are still parts I don't quite understand. The two girls in the cafe who appear twice to talk about crows seem like they were pasted in from some other film. The long Christmas sequence in the middle really slows things down and creates a pretty rough lull in the middle of an otherwise frantically-paced film. The way the film handles homosexuality seems a bit off to my western eyes, but I know Japan has very different cultural attitudes toward homosexuality. But man, these complaints don't add up to much compared to the sheer joy the film's ending brings me. It's always fun to see how Rashomon-style films tie their narratives together, and this one does so in the silliest, most delightful way. This is Gen Sekiguchi's only feature film. I've been hoping for the last decade that he'll make another. He's directed a lot of commercials, which makes sense, but I haven't seen any of them. I also haven't managed to find any of his shorts subtitled in English, unfortunately. His entry in the anthology film Quirky Guys and Gals is available subtitled here and it's really great. He also made two music videos for the band Supercar, which kind of feel like rehearsals for Survive Style 5+. Aw man, I don't know what to say but this movie is amazing and I'm going to insist that everyone I know see it. And Yoko's commercials rule. Every time I get on an airplane Angel Air immediately starts playing in my head. I saw this based on your recommendations and was glad I did. But nothing any of you said prepared me for the amazing sets!